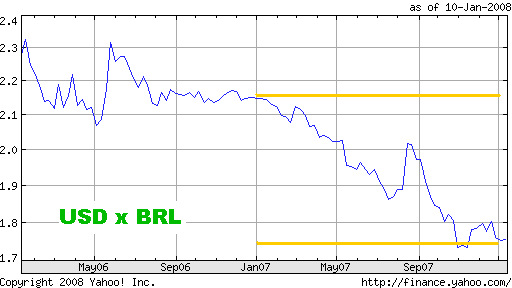 NOTICE: Because of the substantial depreciation (see here) of the USD relative to the BRL during 2007 (almost 20%), the Organizing Committee of ICCA8 decided to reduce the value of the regular fee in BRL from R$ 620 to R$ 540, keeping therefore the same approximated value for the fee in USD as of May 2007. The regular fee includes the scientific programme, the book of abstracts, coffee breaks, refreshments, etc, and the proceedings book. The student fee does not includes the proceedings book. Students who wish to receive it should pay an additional charge of R$ 120. In order to be eligible for the student fee, a recomendation letter from his/her advisor should be sent to the Organizing Committee. Starting March 01, 2008 only on-site payments will be accepted. The on-site Conference fees are R$ 700 (regular) and R$ 250 (student). FINANCIAL SUPPORT: Besides the special low fee for students, the Organizing Committee hopes to support a limited number of participants. However, any request for financial support cannot be examined until the overall budget is known, which is expected to happen in March 2008. If you want to request financial support, please fill the appropriate place in the registration form. The payment should me made by wire transfer. The transfer can be made either in american dollar (USD) or euro (EUR) (or brazilian real (BRL) if you are inside Brazil). For transfers in USD or EUR, use the exchange rate provided by Yahoo!Finance on the day of the transfer. The conversion of BRL 540 in USD is available here and in EUR is available here. Please note that usually there are bank charges for wire transfer. All bank charges should be covered by the participants. Our local bank fee for incoming wire transfer is US$ 15 and it will be charged when converting USD or EUR in BRL. Your bank probably have its own charges for it. Please make sure that your payment covers both conference fee and all bank charges. Don't forget to include your full name and the conference name (ICCA8 - 8th International Conference on Clifford Algebras) in the memo section of the wire transfer. Finally, please send an e-mail to icca8@ime.unicamp.br (subject: payment OK) or a fax (+55 - 19 - 3521 6094) confirming that your payment has been done.